The new ERS MPDM700 supports the increasing demand for fast prototyping and New Product Introduction of advanced packaging in large panel format; it offers ERS´s complete range of thermal debonding capabilities and even more powerful warpage adjustment. ERS electronic GmbH, the innovation leader in thermal management solutions for the semiconductor manufacturing industry, is taking the first ever step towards developing the new generation of thermal debonding and warpage adjustment tools for Fan-Out Panel Level Packaging (FOPLP). 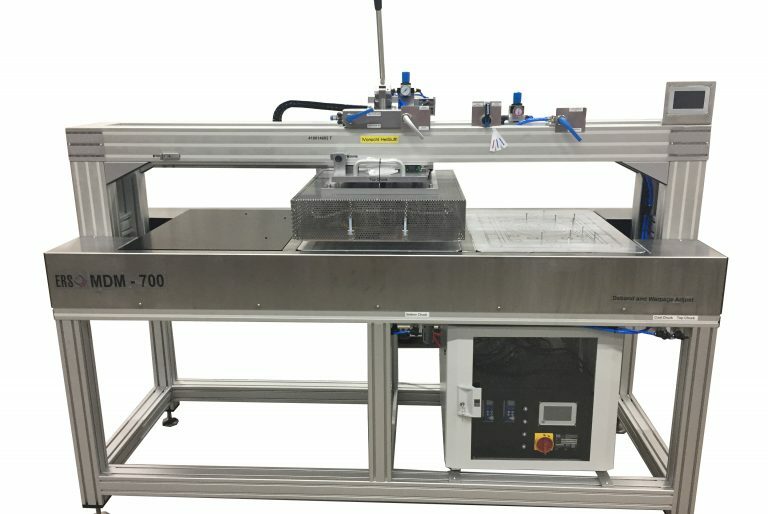 With the MPDM700, users can thermally process any wafers and panels (all formats up to 650 x 550mm carriers) without a conversion kit, making it the ideal tool for research and development teams working on advanced package development, New Product Introduction and pre-production of advanced packaging devices in Fan-Out Wafer Level Packaging (FOWLP) processes. ERS designed the MPDM700 to perform the manual separation of wafers and carriers related to FOPLP technologies and eWLB process. Its special vacuum design and the large range of operating temperatures (up to +240°C) allow the debonding of very thin panels and warpage correction of up to 10mm. Like the previous generation of ERS tools, the MPDM700 features a contactless and smooth transport mechanism, which enables the transport of the panels from one temperature zone to the other while repairing warpage. ERS started shipping the MPDM700 in November 2018 and installed one of the first of its kind in the Fraunhofer-Institut für Zuverlässigkeit und Mikrointegration (IZM), Berlin. “We are pleased to have ERS´s MPDM700 that has enabled us to perform thermal debonding on a 457 x 610 mm panel with more than 13.000 assembled components. Likewise, we are happy with ERS’s willingness to tailor their offer to fit our needs. Furthermore, we believe that the controlled debonding and cooling of large panels signifies a necessary step towards reliable fan-out panel level packaging (FOPLP),” says Dr Tanja Braun from Fraunhofer-IZM. “We are delighted to add Fraunhofer IZM to our list of thermal debonding customers. We are getting more and more demand for large panel debonding and warpage adjustment. The MPDM700 is the first of a series of thermal debonding tools that we are developing with customers by leveraging our experience in thermal debonding and warpage correction of reconstituted wafers,” says Klemens Reitinger CEO & CTO of ERS electronic GmbH.